Squidward: Why are youdoing karate in the kitchen? SpongeBob: l wanted to show l could cut the mustard! 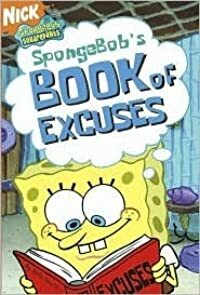 Mr. Krabs: Why did you miss work yesterday? Squidward: l didn't miss it at all! Teacher: Why are you putting on lipstick in class? Pearl: l thought it was a makeup exam! "Sea" inside for more excuses thought up by SpongeBob and his friends -- and even come up with some yourself!